There are certain sectors of the home that hold unprecedented potential for entertaining. A billiards basement, the dining room, a large, open kitchen… It seems like that’s it, and then you step outdoors. For much of the year, a backyard is mostly defined by its taxing upkeep. It can be hard to remember the glory days of summer, until spring arrives, and you find yourself spending more time outdoors. 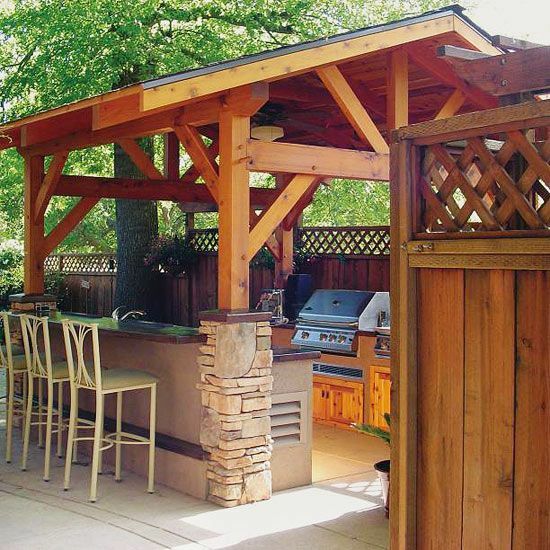 With the right additions to your home, anyone can create an outdoor kitchen perfect for warm weather entertaining. 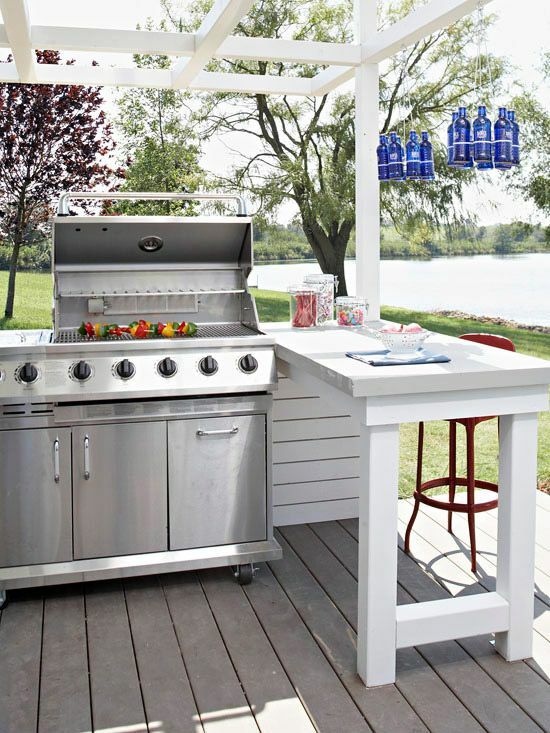 From affordable alterations, to entire upgrades, here are some outdoor kitchen designs for those summer BBQ’s. The center of all outdoor kitchens is the grill. 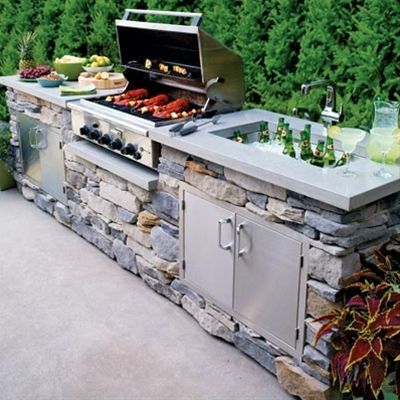 The grill that you choose will have the power to shape the rest of your outdoor kitchen design. Charcoal Grill – If you’re willing to clean more and cook longer for the satisfaction of a smoky flavored meat, this grill is for you. Gas Grill – For the less committed griller on the go, easy to use and clean, and fast. Smoker – The crock pot of the back yard. These are for all day BBQ projects, and are ideal for the true foodies out there. Wood Oven – Similar but different. This appliance is more expensive but perfect for the pizza enthusiast looking for a texture a typical grill cannot fully provide. Envision a BBQ… where do you see your guests sitting? Is there a standardized picnic table, or does your outdoor kitchen design cater toward something a little more built in? Similar to their indoor counterparts, bar and bench seating can be a cozy way to border your outdoor kitchen with guests. Ask yourself how much of the cooking process will take place outdoors. Do you need extra counter space for prep work? Do you want a spot for guests to relax and eat appetizers while you grill? Counters also provide for a more traditional looking kitchen, building a grill into the rest of the kitchen set-up. The final amenities to your outdoor kitchen design. TV – are you planning on watching the game outdoors? Installing a TV under an awning enables you to have the comfort of the living room, while grilling in the sun. Heat Lamps – Nighttime BBQ’s can experience a drop in temperature. Or perhaps you’re looking to construct more of a year-round kitchen; heat lamps will allow you to grill in any weather. Fire Pit – For the less traditional seating area in your outdoor kitchen there’s the fire pit. Roast marshmallows or have a controlled summer bonfire while eating your favorite grilled dinner. Looking to create an outdoor getaway within your own home – Handyman Matters can help! From deck installations, to constructing patios, counters, or cabinets, our craftsmen can work with you to plan the outdoor kitchen design of your dreams. For a free project estimate just call 866-FIX-MY-HOME. There are more decisions that go into planning a patio than may be obvious at the start. How about your gardening interest? Do you want a picture-book effect with borders of colorful annuals, or do you want to spend time just sitting? Imagine your patio as outdoor living space, not just somewhere to clean mud off your shoes or for haphazard deposits of bicycles, toy and garden tools. Today, patios are planned as extensions of livings rooms, with sliding door between, providing a physical connection and ready access. A small patio slab is seldom satisfactory. Plan one of adequate size even if the project must be completed over a longer period of time. Make simple sketches on paper and work toward this goal in small steps, if necessary. The most common type of patio construction is poured concrete. You can also use brick or other loose aggregates, but concrete is a pretty good step-at-a-time material, because the slabs are usually poured in the form of grids and therefore can be done in stages. Concrete is durable and fluid enough to be cast in curves and flexible in surface texture and coloring. It’s also relatively easy to maintain. Take time to consider all the surface options and then proceed with the one that seems most attractive and suited to your intent and the style of your home. Do you plan to entertain a lot of guests? Will you be putting your barbecuing skills to the test? Make the backyard a destination: More people are foregoing costly summer vacations in favor of sinking that travel money into creating a getaway spot in their own backyards. Enterprising homeowners are using decorative concrete to create mini theme parks with faux rock water features, sculpted pools with water slides and garden bridges. Cost-sensible, eco-conscious: Environmental awareness doesn’t have to take a backseat to luxury. Backyard oases must also emphasize eco-consciousness, incorporating environmentally-friendly materials like concrete, which is sustainable. But they also like the organic look and feel that the material can impart. Concrete patios can mimic the look of natural stone – even lava – without the eco-impact associated with quarrying the real thing. Plus, concrete costs considerably less than many natural stone products. Furniture built to last and last: Anybody can go to the local home improvement store and pick up a patio set. The truly trendy backyard designer turns to permanent backyard furniture, custom-made to fit your yard’s style. Custom concrete furniture can take on any shape, from pool tables and benches to patio tables and planters. It lasts a lifetime and never needs to be painted or refinished. Light my fire: When it comes to creating ambiance, few home improvements pack the wallop of a fireplace. Outdoor hearths are growing in popularity as homeowners continue to recreate all the appeal of their home’s interior in the backyard. Whether you choose gas or wood-burning, custom designed or pre-cast, adding a fireplace to your outdoor landscape is sure to light up its appeal. Size – and shape – matter: We’ve all seen patio disasters – the sprawling slab that totally dominates a tiny backyard, or the postage-stamp-sized patio that appears lost in a sea of grass. Homeowners are no longer leaving patio size to chance. Instead, they’re putting a lot of thought and planning into right-sizing their patio to create a living area that meets their needs and fits the profile of their backyard. Determining how your space will be used and how much you have to work with before you undertake any remodeling will save time and avoid regret later on! Whenever you are researching patio ideas there are numerous elements to look at: lighting, furnishings, heating and the types of functions you will want to utilize it for. Will you be utilizing this outdoor space largely for relaxing or will you use it as an additional living and entertaining spot? Patio designs which include a fire pit could make the space not just cozy and relaxing but very exotic also. A fire pit can be built into the outdoor patio with bricks or stones, or it may stand alone and still have the flexibility to be moved as needed. Most important is the fact that as soon as the sun goes down and the weather is cooler, the special event can still continue. You will discover quite a few patio ideas that also contain beautiful water features. A fountain or small waterfall can also be built with the use of the many unique and gorgeous rocks which are now offered and very easy for almost any homeowner to install. You can to find pre-built water features online or at home improvement stores that anyone can merely set in place, fill with water and plug in. The sound of trickling water sets the ambiance for relaxed entertaining. Light is another yet extremely significant element to think about in patio designs. There are many affordable choices of lighting on the market today. You’ll find several solar or low voltage selections that produce excellent illumination and create plenty of atmosphere for virtually any outdoor living space. Shade is another factor to consider in patio design. The form and degree of shading you are going to want depends on the direction your patio is facing and the amount of natural light you want. Canvas awnings are a colorful and affordable way to manage both shade and temperature. The finishing touch will be the pieces of furniture you choose. Modern patio furniture is very weather resistant and can last for quite a few years. Almost all outdoor patio furniture can be casual and stylish at the same time. Patio canopies are particularly convenient for residences with a swimming pool, backyard deck, or other large and exposed areas. For added comfort, privacy and security, manufacturers even offer screen attachments to close off a desired area. For wide-open patios, canopies effectively allow an extension to the house or even a new room, giving the homeowner wider space and more comfort. The exposure that patios have to rain, snow, sun and the elements has encouraged canopy manufacturers to come up with varying models of different materials, from retractable awnings to aluminum patio cover kits. Some covers are made from heavy-duty vinyl and are available in various sizes. Some companies offer lattice patio cover kits, created primarily for garden settings. The market includes types made from aluminum material that feels and looks like wood, without posing any of the typical problems identified with wood, including peeling, warping, repainting, or attack by termites. Other desired features include wind-release protection and awning flexibility. There are portable and permanent models, created for every type use imaginable. Combined with appropriate lighting in the evenings, patio canopies bring a festive air to a backyard party or barbecue. An online perusal can provide a wealth of information regarding the styles and types of canopies available to homeowners these days. Ready To Plan Your Patio? Will your patio be a do-it-yourself event, or something elaborate enough to warrant utilizing profession construction services? Be armed with answers to all of these questions before you undertake the process. An outside area for relaxation and entertaining can be terrifically rewarding, and therefore deserves a good deal of consideration at the start of the project.